The 30-Drawer Organizer is the perfect storage solution for a wide variety of items. 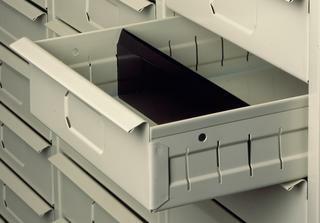 Anything from small parts to literature, office supplies and company forms can be easily organized and made accessible. The organizers all-steel construction ensures long term durability and use. Organizers are available in both letter and legal-size models to handle company forms, supplies, small parts, etc. 9"W x 2-1/8"H dividers for Tennsco 30-Drawer Organizers.